Employee houses built with concrete for optimal energy performance. Park officials set the lofty goal of making the structures 40 percent more energy efficient than a standard home. 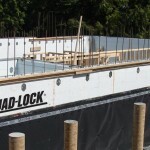 They achieved this level of efficiency through the use of Quad-Lock insulating concrete forms (ICFs). Read the full article here.